Last month, the Between the Waters team was joined by Joseph McGill, founding director of The Slave Dwelling Project, for a week-long series of events at Hobcaw Barony. Following our “Voices of the Village” panel discussion, Patrick Hayes joined McGill (and Hobcaw volunteer Alec Tuten) during his overnight stay in the former home of Laura Carr, a formerly enslaved woman who worked as a field hand and midwife. 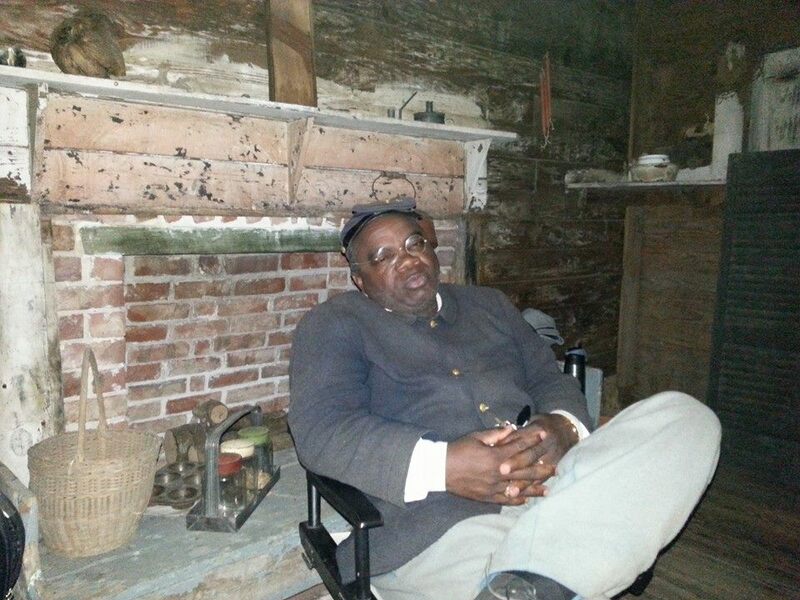 Joseph McGill relaxes in front of the hearth in Laura Carr’s home before participating in an interview for our forthcoming Between the Waters virtual tour. Brief but inspiring, our overnight stay in the dwelling sometimes called the “Carr Cabin” or “Laura’s House” began somewhat late in the evening with arrival and setup for a videotaped interview. The plan for our interview set with Mr. McGill was to keep shadows and dark corners of the interior intact to approximate the light, most likely that of a candle or hearth, that Ms. Carr and others who lived there might have experienced. The irony of how easily this dwelling could be lit, if not overly lit, by a battery powered LED light kit purchased on the internet was not lost on us. Our extended interview with Joseph McGill covered a range of topics, some familiar to those who have spent time with Mr. McGill, others unique to our visit and this particular dwelling. We discussed Ms. Laura Carr’s role as Friendfield’s root doctor and midwife and how that layer added to his experience and interpretation of the space. We also discussed Robert McClary, a former resident of Friendfield Village, and how his ongoing visit provided a rare opportunity for Mr. McGill and the public to interact with someone who had lived in a dwelling relatively unchanged since the antebellum era. This videotaped discussion with Mr. McGill will be part of the Between the Waters web documentary and virtual tour in 2016. 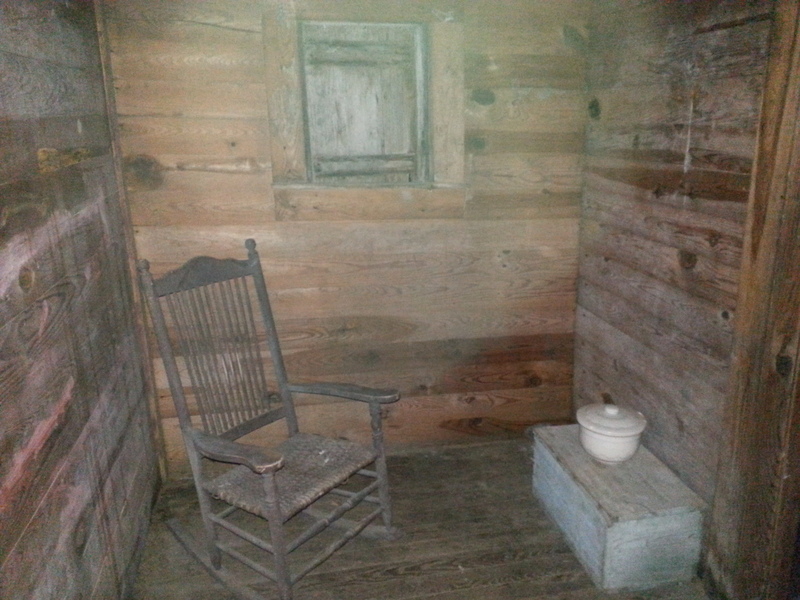 The Between the Waters team shared this tiny room in Laura Carr’s dwelling. The “living room” is not much larger than this space. We took to our bedrolls almost immediately after the interview. Though the spring weather was particularly kind that night, I imagined how extremes easily changed the situation during Ms. Carr’s time. Rest, while not fitful, was full of strange, vivid dreams certainly influenced or suggested by the history of the space. One dream in particular, that of a hand placing a smooth river stone on my head as I slept, continues to be a topic of discussion between me and my colleagues. I awoke to my colleague sitting on his bedroll using his phone to take a photo of a shuttered, barndoor-style window through which a thin square seam of sunlight leaked into the room. Perhaps it was this same seam of light that Ms. Carr, or those who lived here before her, woke to every morning as well. Clearly, as I later learned, her day would have already begun. 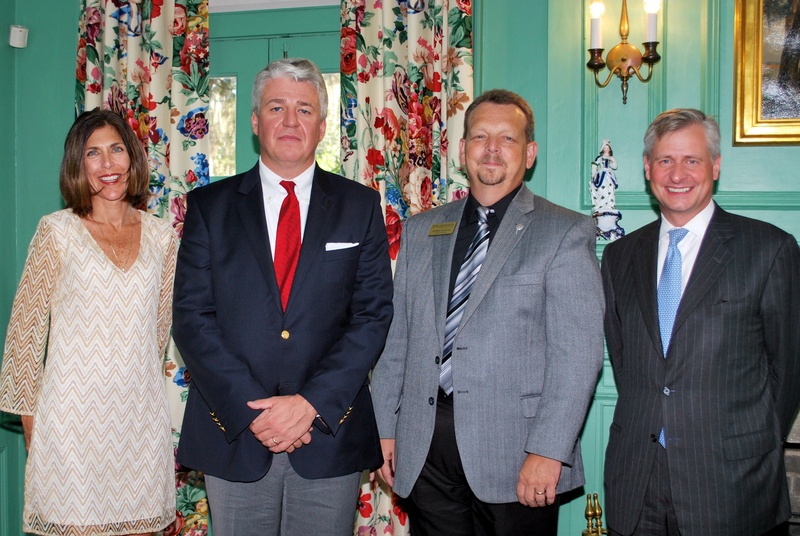 George Chastain, executive director of the Belle W. Baruch Foundation, (third from left) poses with friends in the living room at Hobcaw House. Photo courtesy of Hobcaw Barony staff. In this episode, we speak with George Chastain, Executive Director of the Belle W. Baruch Foundation, the non-profit organization and owner of Hobcaw Barony in Georgetown, South Carolina. Chastain reflects on the Foundation’s history, its mission; and vision as they celebrate their 50th anniversary. To learn more about upcoming events and public programs at Hobcaw Barony, visit their website at www.hobcawbarony.org.